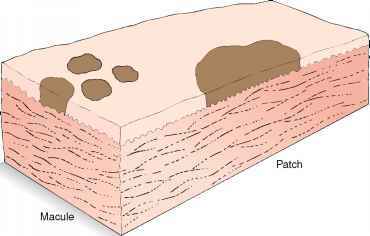 If a skin lesion is found, it should be classified as a primary or secondary lesion, and its shape and distribution should be described. 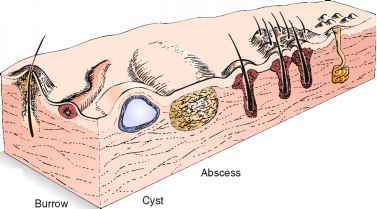 Primary lesions arise from normal skin. 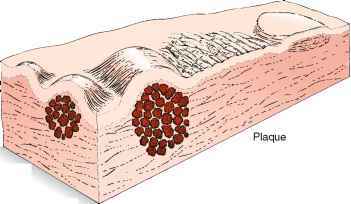 They result from anatomic changes in the epidermis, dermis, or subcutaneous tissue. The primary lesion is the most characteristic lesion of the skin disorder. Secondary lesions result from changes in the primary lesion. 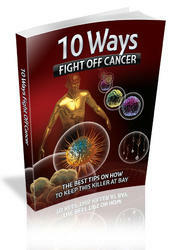 They develop during the course of the cutaneous disease. The first step in identifying a skin disorder is to characterize the appearance of the primary lesion. In the description of the skin lesion, the clinician should note whether the lesion is flat or raised and whether it is solid or contains fluid. A penlight is often useful to determine whether the lesion is slightly elevated. If a penlight is directed to one side of a lesion, a shadow forms according to the height of the lesion. The three specific criteria for a dermatologic diagnosis are based on morphology, configuration, and distribution, morphology being the most important. The purpose of the following section is to acquaint the reader with the morphologic features of the primary and secondary lesions and the vocabulary associated with them. Furuncle to their occurrence below or above the plane of the skin (Figs. 8-21 and 8-22). 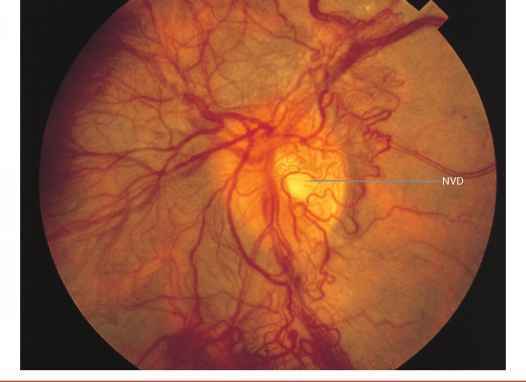 Other important lesions are shown and described in Figure 8-23. It is not essential for the examiner to make a definitive diagnosis of all skin disease. A careful description of the lesion, the pattern of distribution, and the arrangement of the lesion often points to a group of related disease states with similar manifesting dermatologic signs (e.g., confluent macular rashes, bullous diseases, grouped vesicles, papular rashes on an erythematous base). For example, grouped urticarial lesions with a central depression are suggestive of insect bites. Figure 8-24 lists the terms used to describe the configurations of lesions.